It was late ‘59, I was singing and practicing on my cool Fender Telecaster, and trying out the new Fender amp with duel 9 Jansens. Jack Pearson was walking by, headed toward home just up the block from my place in the gritty neighborhoods of north Yakima, and he heard the sounds coming from the basement. A few days after my “audition”, we were talking about starting a rock band. He'd been into guitar for some time, but finally decided to form a band because I fit the somewhat hard to find guitar/vocalist spot. In no time we'd recruited Tony Platter, Jim Perkins, and Jim Shinpaugh, all of us Davis High classmates, and all from what would later be realized as the fertile talent pool of the north side. 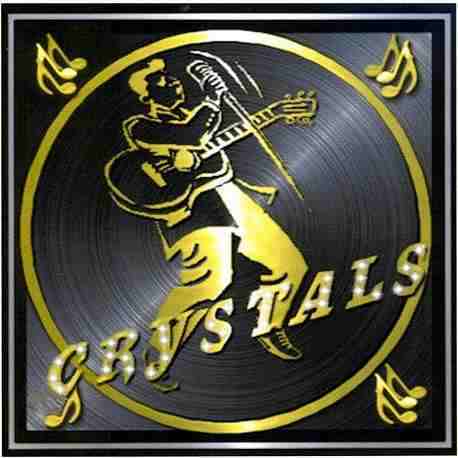 Over our high school years the Crystals became a tight, versatile group; experimental and improvisational, we enjoyed hours of rehearsal as much as the gigs. We played a full range of bookings from house parties to some of the best venues in the central Washington area, living experiences and making friendships that would last a lifetime. As we now have the time to look back, besides being some of the fortunate few young musicians to be part of the American “Garage Band” phenomenon, we realize that we were just as importantly part of an integral phenomenon that would come to be know as “The Northwest Sound”. And, that's a quiet pride you carry around with you like the pictures of your grand kids. Graduation, more education, careers, marriage, and for me, also a passion for motorcycles, ended the band. I freelanced, played solos and all sorts of weird gigs until I was married. Work, school and job training put me on the road for a few years, and when we finally decided to settle down back in Yakima, it was just natural to hook up with a group of guys who'd come out of the old neighborhoods, having had their own experiences as musicians. Don Frank, (Danny And The Seniors, The Rare Blend), drummer Rich Meader (The Majestics (Yakima), John Web on piano, and Dave Rodriquez, bass (bands in research) and subsequently Larry Taylor on base guitar. Reading about and researching all the bands of our time has been intriguing to me because many times there would be a rush of interrelated memories out of an article, things I hadn't remembered or thought about in decades. I'll relate a few of these below, but for now I'll let the other guys get in a word. 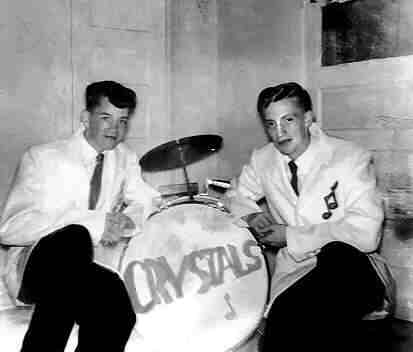 As I recall now, I got started with the band to become known as the “Crystals” in 1960, during my junior year at A. C. Davis High in Yakima, Washington. I had played in the percussion section in grade school, and a classmate of mine through grade school, junior high and high school was Jack Pearson. Jack had eventually started playing guitar in high school and had joined up with some classmates, Bob Selzler and Tony Platter in and garage type band. Jack invited me over to watch them practice at Bobs house one time and I was hooked. My earliest memories of those days are of when, while watching them play, I had acquired one of those round Quaker Oat Meal boxes and had used that as a makeshift drum, keeping the beat while they played. I guess they were impressed with my so-called drumming, and after coaxing me to get some drums, and three of us twisting my mother's arm to buy me a trap set of drums, I officially joined the band. From there we basically became a “garage band” and played for neighborhood parties, practicing a lot at either Bob or Jack's house. After naming the band, we felt we were ready to make the scene. In order to assist us in getting our name out there and in getting paid gigs, we brought in another friend and classmate of ours, Jim Shinpaugh, as band manager. As was popular in those days, a lot on local bands wore some kind or jacket or suit. We enlisted Bobs aunt and Jack's mother to custom make some sport jackets for us. The jackets were white silk with lapels and sparkly red eighth notes on one side. The first paid gig Jim got for us was a German wedding reception dance at the Terrace Heights Grange just outside Yakima, and we were off and running. Later, we added saxophone player, Jim Dalrymple, and Gene Rima who played a mean boogie-woogie piano. We played many venues in and around Yakima during the next year or two, such as school dances, paid-event house parties, a Yakima teen club called “The 98 Club”; and in Ellensburg, at the YMCA for the Ellensburg High Bulldog Club, and dances at Central Washington University. 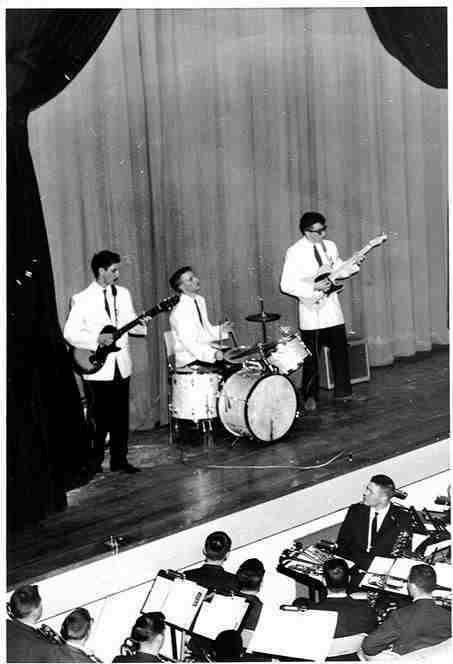 We also competed in the A. C. Davis High talent show in 1961, coming in second to a professional show band called the Silvertones. We also played with other local bands in a local media venue in Yakima at that time called “Valley Bandstand”. After graduation in 1961, the band sort of dissolved due to members going one way or another, and I moved on to play for a short time in a western band at the Happy Hour Tavern in Yakima. I still have a few pieces of my original drum set, though at almost fifty years old they're not in real good shape. I remember Jim first using a Bongo drum and an arrow shaft as a drumstick. 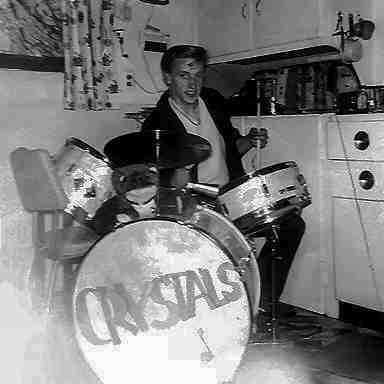 It wasn't long before Jim had a complete drum kit and we were on our way. I was playing a Gibson Melody Maker which had these really great treble sounds. I always felt that Bob and Jack were more accomplished guitar players but I learned a lot from the interaction with them. In those days there were numerous instrumental songs that rock bands played. However, sooner or later, somebody has to sing. Although I sang bass in choir, I did not have a lead voice and would have been terrified even if I had the voice. Fortunately, Bob had the voice and he became our frontman. Jim describes our first paid gig at a Grange hall East of Yakima. I assure you it was not much money, but everybody had a good time. Bob had learned four German songs that we played numerous times during the performance. People kept requesting them but as the evening wore on, and more booze was consumed, the rock n’ roll started becoming more and more popular. It was so cool to see all these people dancing to our music and having so much fun! If I wasn't obsessed before, I definitely was after this performance. As we performed more, we sounded better and our audiences seemed to grow and be more enthusiastic. We went on to play a variety of different venues including lots of private parties. The gig in Ellensburg for the Bulldog Club was memorable. It was a large and enthusiastic crowd and we fed off of their energy. I have some recollection of lying on my back while I was playing. How weird. I was completely consumed by rock n’ roll and blues. Major milestones in my life were learning the Key of E and learning to play bar chords. At the time we were growing into our musical identities, there was a whole rock and blues music scene flourishing in Yakima. There were several accomplished bands and going to live performances was one of my favorite things to do. We would always stand as close to the band as possible and try to steal riffs. My favorites were The Flames and The Checkers. Not only were they great musicians, but they were real showmen too. This was one of those special times which soon was followed by the Viet Nam War and all the social turmoil of the 60’s. So looking back, it has the feel of a time of innocence that would soon be overshadowed by the crush of world events that would not be denied. Later, I would find myself in the Mekong Delta serving as a combat medic with the 9th Infantry Division. But I had more music to play before putting on the uniform. Musicians have a tendency to go from one experience to another. It's as if you always search for that one sound or performance that validates the whole experience. OK, you also try to maximize the money too. At any rate, we gradually migrated to other musical endeavors one at a time. Jack ended up playing lead guitar for The Fabulous Stereos. A short time later I followed him and became their bass player. This was a band with guitar, bass, saxophone, drums, piano and singer. We played around Yakima and the Central Washington Area. We played regularly in Roslyn at the Mason’s Lodge which we rented. This band broke up after a few months and reformed as Little Les and the Chasers. Our sax player, Larry Graham, left and formed a new band. Larry was the best musician of the group and so we moped around for a couple of weeks mourning his loss. It wasn't long before we put the Chasers together and started playing around the area including Roslyn. In 1963, I went to Central America to serve as a missionary for my church. I was to spend thirty months there. During that time I played in a folk-music group called the Robert Wai Quintet for almost one year. We played acoustic guitars and sang close harmonies. Yes, they wrote a vocal part for me which required me to focus harder on the singing than the guitar playing. We traveled through Guatemala, El Salvador, Honduras, Nicaragua and Costa Rica. Frankly, we sounded pretty good. I returned to Yakima in August of 1965. The Viet Nam War was raging by now and I was soon drafted into the United States Army. While in basic training at Fort Hood, Texas, I did several jams with various soldiers including the drummer for The Champs of Tequila fame. Once I was in the Mekong Delta at Dong Tam, I performed with some guys from the 61st Infantry at the enlistedmen’s club. We did a lot of Sam and Dave stuff. Obviously, I survived Viet Nam. It was a rock n’ roll war. Armed Forces Radio played music all day long. The first time I was under attack, the radio was blaring with The Monkeys singing I'm A Believer. Music has been with me through all these times. It helped me through college and law school. I have always had at least one guitar. At present I have five guitars and three amplifiers. Some day I want to start a band. We were heavily influence by, and genuinely liked, Northwest rock. We covered the most popular Ventures and Wailers songs. The Fire Balls (New Mexico) were favorites (in fact, as I recall Torquey was our theme song until Jim Perkins threatened to quit because of the endless requests and repeats ;-), The Champs “Tequila”, and anything Buddy Holly (until he added strings and horns), and of course we stayed on top of the top 40. Personally, I was nuts about anything King - Albert and Freddy, and later B. B. In 1960 these were little-known musicians' musicians, years before they were really “discovered”. For a time we played those licks like our secret code; deep south R&B was so fresh and strange to Yakima it could have been Martian. San Ho Say, baby. Here are a few interrelated memories and facts, along with some favorites, that I got out reviewing the Yakima and Northwest rock band scene of the 50’ and 60’. - Lead Guitar for The Flames, Del Kary, and I were pals from 2nd grade at St. Paul's elementary until marriage. Del had this cool ‘56 Merc. We worked together briefly and we'd go pin balling together regularly in the time after the Flames and the Crystals, and he swore that Merc just didn't want to run under 100 mph. It usually didn't! - Once, when The Flames were reorganizing, I met with Lew and Larry to interview for lead guitar. We met at the house of one of the other band members. Later, when married, I would rent this same house, the house where we lived when my son was born, good connected memories, for sure. Kingsmen ;-). The guys… Berry Curtis and Kerry Magnus, just two of many musicians of note whose careers started in Yakima Valley rock bands. - The Lewisville was one of the taverns owned by Mike Mandel’s [Checkers (Yakima), Rumblers (Yakima)] dad, and is a fixture in our old neighborhood to this day. Not that we would ever hang around such a place, being under age and all, but one night Mike's dad asked if I could give Mike and his friend a ride home, since the friend had gotten too…umm, impaired to drive, and as Mike said, ‘I don't see too well at night’. We cruised out to Mike's parent's place in the hills of Terrace Heights. The place was cool - Country Club golf course, overlooking the city lights, blah blah. Mike had enjoyed the ride in my convertible and we'd seemed to hit an accord in the types of music we liked, so he invited my friend and me to stay for the little party about to start. As I remember, the party took place in the large well-appointed home. Mike kept an entire set of instruments including drums and amps, that he said he owned, set up there ‘in case someone came over and wanted to play’. Some of the older, iconic players from around Yakima and beyond drifted through that party. Not easily impressed, I was. I went back to a couple of other such events before Mike moved on to bigger and better things. From time to time over the years I would hear the recurrent goofy rumor that, when Mike hit the Puget Sound scene, keyboard players in really good bands would hear Mike Mandel play and just give up the music business, never to play again. I would smile at the absurdity, and also because as exceptional as he was, not once did I ever see a lighting bolt fly out his a$$. ? - Once, we were playing a fraternity dance at CWU. It was mid-week, the big hall was nearly empty and it looked like a flop, but the Luck of Thaddeus was with us. Many times in the Crystals I was mistaken for Rich Dangel of the Wailers, not that we looked that much alike up close, but same lankyiness, hairstyle and horn-rims, and everybody copied the Wailers band-kick right off of their famous album cover. We were setting up and I was practicing my kick, when three co-eds came up and asked if I was ‘that guy from the Wailers’. Now, while I didn't exactly say I was, I didn't exactly say I wasn't. Soon, minor hysteria broke out. Word spread around town that one of the Wailers was sitting in with the band; the dorms emptied out and the joint was jumpin’. While it's fun and flattering to remember being mistaken for a personal idol from one of the greatest northwest bands ever, it's also great to remember that, while the Wailers fame might have got the crowd there, The Crystals kept them there; to the point that, as a symbol of their appreciation, the crowd passed the hat several times during the night. We left town having made new fans and with about three times the booking pay. - I could go on and on with stories from those days, but some of the fondest memories are the simplest: The Davis High Talent Show in ‘61; Battle of the Bands Radio shows at the Women's Century Club; blowing our pay on pizzas at The Lariat Drive-in while recounting the good times after playing dances; dragging “The Ave” in lowered Fords, Chevs and Mercs, and in a particular favorite of my own, a white ‘53 Olds-98 ragtop with flipper hub caps, and listening to Northwest Rock. With art/design backgrounds, another member and I began working on a band logo. But the band took off so fast we were too busy to bring it to completion. This is from memory of the main concept - the rockin’out artwork imposed over a 45-rpm single record. artware/artwork to revitalize photos, and polish the logo. James C. Perkins, known as Jim or Jimbo by friends and family was called to Heaven on Sunday, Oct. 28, 2012, after a long and courageous battle with cancer. He was welcomed with open arms by his mother, father and Jesus. Jim was born on Sept. 2nd, 1943, the only son of Floyd and Evelyn Perkins. He was raised in the Yakima Valley, where he graduated from A.C. Davis High School in 1961. It was there that he met and married the mother of his children, Sheila Harris, in 1963. During those years, Jim and Sheila welcomed and raised three daughters, Jami Lynn, Carrie Anne, and Jodi Kristin. During this time Jim began his 40 year career with the U.S. Postal Service, where he started out working on the mailroom floor, and then worked his way up to timekeeper and finally became Supervisor of Employee Relations at the Yakima Post Office. He very much enjoyed the challenges and responsibilities of being Supervisor of Employee Relations until his retirement in 2003. Fortunately, Jim and Sheila were better friends than spouses and decided to divorce amicably in 1992 after 29 years of marriage. While in the last few years before retirement, he met and fell in love with Sandra Carr McCall (the result of a blind date). It was apparent that they completed each other and got married in June 1999. Now that Jim was happily married, and having retired in 2003, he felt he could still do so much more to help others, that he began his volunteer work, putting in more hours than he had while working. He first began delivering meals to the elderly with the Meals on Wheels Program, and while doing this he began putting in many hours at Yakima Valley Memorial Hospital, also as an Ombudsman for the Summitview Care Center and as a S.H.I.B.A. volunteer. As the S.H.I.B.A. volunteer, he received the Graham Tollefson Award for his outstanding achievements within that organization. He enjoyed his volunteer work so much that he continued to volunteer as much as he could, until his health would no longer allow him to. Jim is survived by his wife of 13 years, Sandy and their kitty cat, Gertie; his first wife, Sheila Reynolds; three daughters, Jami Lynn Olson and husband Kenny, Carrie Anne Harris and husband Tom, and Jodi Kristin Skinner and husband Jory all of Yakima; grandson, Jacob James and Casey Dean; granddaughter, Angelica Grace also all of Yakima; two step-sons, Shane McCall and wife Jenna of Baltimore, Maryland, and Mattheu McCall of Charleston, S.C.; sisters, Bonnie Caron of Sumner, WA and Alice Perkins; and numerous other relatives. He was preceded in death by his father Floyd Perkins in 1958, his beloved mother Evelyn in 1986, and numerous half siblings. Sandy is comforted by the fact that their cat George was also there to greet Jim in Heaven. Viewing will be from 4 – 7:00 pm Thursday, Nov. 1, 2012 at Langevin-Mussetter Funeral Home. Graveside services will be 11:00 am Friday, Nov. 2nd at Terrace Heights Memorial Park. In lieu of flowers the family requests donations be made to Cottage in The Meadow. Langevin-Mussetter Funeral Home has been entrusted with the arrangements.